Gambler - owner Donna Looman painted by T.E.A. Welcome to Towns End Art ! Just a little background information for the curious. I've been showing model horses since 1994 with customizing following in l995. With a degree in Commercial Art and a Veterinary Technician degree I've been involved with animals most of my life. My Daughter and I both enjoy showing, both model horses and real horses. 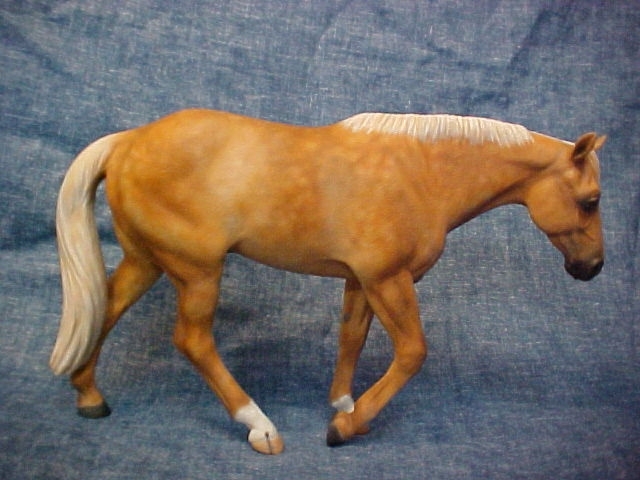 The model horse interest started when I was quite young and my Parents knew what would please their "horse-crazy" child...what else....Breyer and Hartland models. I was fortunate enough to have been given some models that today are much sought after, and since I only received them for Christmas, I cherished each and every one and took great pains to protect them. I've now passed this great hobby onto my Daughter and we both enjoy collecting and showing models horses together. 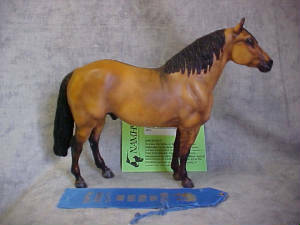 At one time I only sold my custom work at live shows or through friends who attended Breyerfest. I was finally convinced to "get on eBay" and take custom orders. I must say I've met the nicest people since. Please stop by often and see what's new, who's winning, and my ebay auctions. I'm now becoming very recognized for my custom work on Carol Herden resin cows. I am also an official "COWS outlet". I will be selling blank resins as well as painted cows. Many performance showers invest a great deal in their tack, dolls, and arena set up. Why not make the picture perfect with a LSQ cow?! Please feel free to email me to see what cows I have available!